If you need to rename a SOLIDWORKS file, you can do so by choosing to rename it inside of the feature tree by right clicking on the file and then selecting “Rename Part”. This will temporarily rename the file until you save and close this parent file. You will also have the opportunity to update any references that the file may be used in. Once your part has been renamed through SOLIDWORKS and saved, the file will have a new name inside of Windows Explorer and inside of SOLIDWORKS. Now that everything is taken care of the SOLIDWORKS side, we need to update the information inside of DriveWorks. 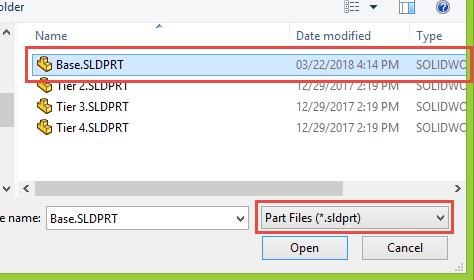 If you open the DriveWorks add-in, you will notice that it can no longer find the “Tier 1.sldprt” file while “Base.sldprt” is considered a new, uncaptured file. We will need to change this using the DriveWorks Data Management tool. Since we do not want to lose everything that we have captured and driven for the Tier 1 part, we will have to tell DriveWorks that this is now a different file name and should point to the new name instead. You will first need to open the DriveWorks Data Management tool and log into the DriveWorks group. (Don’t forget to check the “Data Backed Up” box!). Then go to the “Captured Information” section and you will notice that the file that was renamed is considered missing. To fix this, simply right click on the missing file and choose “Change Location”. You can then re-browse to the file that had its name changed and re-select it. You may need to change the file type setting at the bottom as it will automatically default to the original file name. When you find your file, select it and choose “Open”. Now that the file has been repointed, it will no longer be considered missing and all of your rules that you had originally set up will be set for the new file name as well! 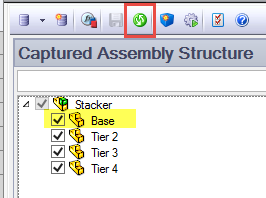 Using the DriveWorks add-in inside of SOLIDWORKS, you can refresh the captured file assembly structure and notice that the correct file is now being used.